Jack Mapanje was born of Yao and Nyanja parents in Kadango Village, Mangochi District, in southern Malawi. He went to school at Kadango, Chikwana Mission, and Zomba Catholic Secondary School. He has a B.A. degree and a diploma in Education from the University of London. In 1975 he joined the staff of the Department of English at Chancellor College, University of Malawi, as a lecturer, before working as a research student in linguistics at University College, London in the early 1980s. 'Of Chameleons and Gods' received the Rotterdam International Poetry Award in 1988. Mapanje was arrested soon after this book was banned in Malawi. He was imprisoned in Malawi and detained without Charge or Trial from September 1987 to May 1991. His second volume of Poetry, 'The Chattering Wagtails of Mikuyu Prison', written while he was detained, was published by Heinemann in 1993. Jack Mapanje's classic Malawian volume, spanning ten turbulent years. He describes his poetry as a way of hanging on to some sanity. 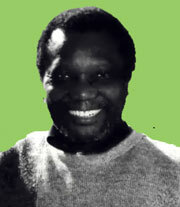 Jack Mapanje, poet and theoretical linguist was imprisoned in Malawi from September 1987 to May 1991. He was detained without charge or trial. A collection of poems that condemns the Malawian regime that incarcerated him whilst celebrating the love of family, friends and the spirit of his fellow detainees. Only now, with freedom, can Jack Mapanje speak of his harrowing ordeal in Mikuyu Prison, where 'desperate voices of fractured souls' clamour to be heard. In poems of uncommon power and unflinching description Mapanje condemns a brutal regime. Yet in these poems Mapanje also affirms the enduring love of family and friends and the spirit of his fellow detainees. Today, living in England, he celebrates the hope kept alive by those who fight for human rights. This anthology introduces the African literature of incarceration to the general reader, the scholar, the activist and the student. The visions and prison cries of the few African nationalists imprisoned by colonialists, who later became leaders of their independent dictatorships and in turn imprisoned their own writers and other radicals, are brought into sharper focus, thereby critically exposing the ironies of varied generations of the efforts of freedom fighters. Extracts of prose, poetry and plays are grouped into themes such as arrest,interrogation, torture, survival, release and truth and reconciliation. Contributors include: Kunle Ajibade, Obafemi Awolowo, Steve Biko, Breyten Breytenbach, Dennis Brutus, Nawal El Saadawi, M J Kariuki, Kenneth Kaunda, Caesarina Kona Makhoere, Nelson Mandela, Emma Mashinini, Felix Mnthali, Augustino Nato, Ngugi wa Thiong’o, Kwame Nkrumah, Abe Sachs, Ken Saro Wiwa, Wole Soyinka, and Koigi wa Wamwere. Although an often harrowing indictment of the history, culture and politics of the African continent and the societies from which this literature comes, the anthology presents excellent prose, poetry and drama, which stands up in its own right as serious literature to be cherished, read and studied.